It was almost a good month to be Native. The start of the month was a real win for all our peoples, with Oklahoma City proclaiming its first official Indigenous People’s Day; forever replacing Columbus Day, there was a beautiful breakout of parades and pride throughout the entire city. But, then Elizabeth Warren had to get her DNA tested for Indian blood (or lack thereof), officially making it open season for Republicans to mock and sneer at the millions of innocent Natives who had nothing to do with her 23 & Me gift certificate. That’s why last Friday I had to take a breather and clear my mind at the latest OKC Pow Wow Fundraiser, held at the Mayflower Congregation UCC, 3901 NW 63rd Street. The oldest Intertribal Native American heritage organization in Oklahoma, the club has been hosting these tasty fundraisers over the past few years, with proceeds going to help fund programs and events that foster and encourage both the community’s and the individual’s self-respect, self-reliance and self-confidence. And as great as all that is—and it definitely is great—what made me determined come Hell or high water to attend this month’s fundraiser was the interesting inclusion of the club’s own culinary invention, the exciting Pow Wow Burger, the only other item on the very small menu. At only ten bucks—with drinks and dessert included in the price, of course—I couldn’t think of a better way to let my hunger help the group. 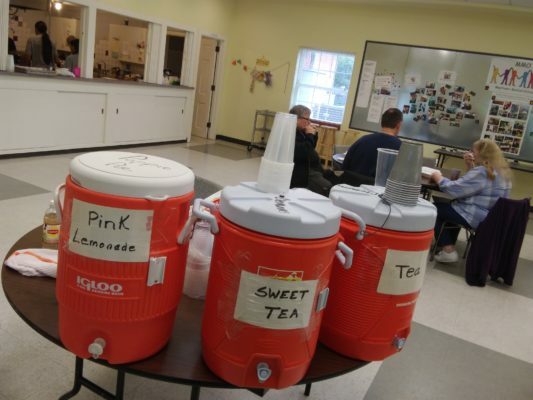 Located in the church’s cafeteria and kitchen, it looked as though I had just missed the lunch rush; teen volunteers were rotating between bussing tables and putting together the Indian tacos in the back. Happily paying my money as I walked in, the woman at the table wrote my order down—one Pow Wow Burger, please—and I gave it to the cooks to prepare as I hung out and sipped on some sugary pink lemonade from the convenient nearby orange cooler. As the ladies in the kitchen hand-molded me a nice thick patty from pure ground beef, one set it on the grill to sizzle as another started frying my equally handmade buns—two chunky pieces of frybread, in all actuality—with a head-swirling scent almost straight-up knocked me out. It had been so very long since I had that blissful Native-bred bread, browning delicately in the hot vegetable oil. Once to their liking, they laid the bread down on a paper-plate and loaded it with all the typical accoutrements you’d want or need, with the final touch being that hot hunk of brown beef, placed gingerly on this already full Indian-burger. 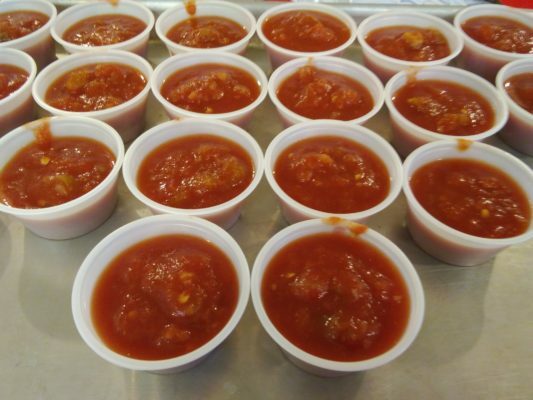 Grabbing a couple of cups of picante from the rows set up on the counter, when I got to my table, I made sure to pour one or two servings on the frybread, just for a little bit more of that much-loved taco flavor on my much-lauded burger. 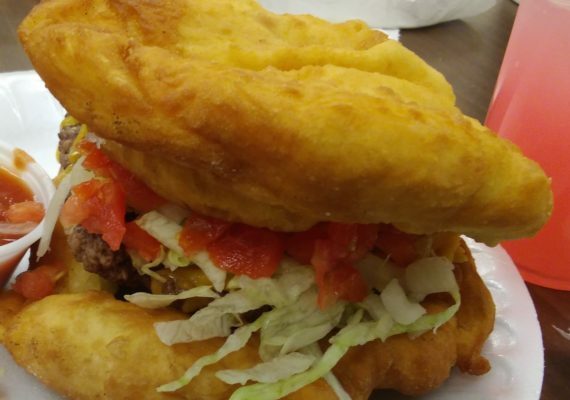 I’m glad I was in a church, because as I slowly and patiently devoured that Pow Wow Burger, it made it so much easier to give thanks to the Creator for this beautiful marriage of frybread and meat. This was everything that a homemade burger—Native or otherwise—should be, and really everything that you wish every burger could be. 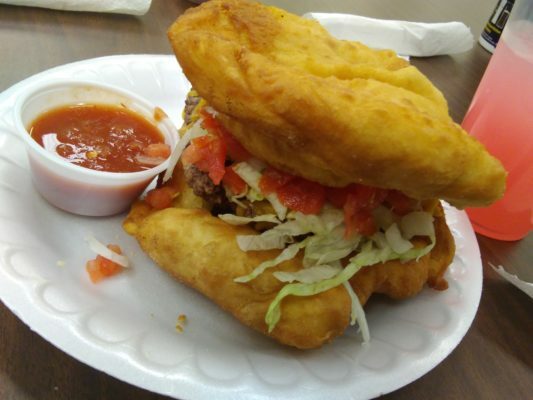 The chopped lettuce, tomatoes, onions and cheese all did their jobs beautifully, but it was the sweaty piece of steaming beef and the two crackling pieces of frybread that were definite perfection. And then a news alert came on my phone: the courts upheld the ruling that made hundreds of Indigenous peoples in North Dakota ineligible to vote due to unfair and unjust voter ID laws. Damn. Louis, I realize this means getting up kind of early on Sundays but……. How about you go around to the various churchs on the days they hold lunch buffets in their Fellowship Halls and rate the casseroles, cobblers, potato salads and jalepeno cream corns. My guess is the Indian Baptist Church in Moore gives Mayflower a run for it’s money with their Indian tacos. The taco sale was a fundraiser for the OKC Pow Wow club and their members did the cooking. The Mayflower church just rented the dining room to the pow wow club. This event is put on by the all Native American 68 year old Oklahoma City Pow Wow Club. We just hold the event at Mayflower Church 4 times a year. There is still INJUSTICE going on!!! We still have work to do, but still have to eat. It just helps us fight harder! I did not hear any whites say that. I heard lots of condemnation towards E Warren. We have some unstable people in this world. Let’s try to keep the hate talk talk down.